The latest "Seven-Mile War" in boys basketball came down to the final four seconds. Down by one point at home to rival Scappoose on Jan. 11, St. Helens tried to work the ball for a final shot in the closing seconds. The Lions got not just one shot but two, and that made all the difference. Senior forward Ryan Hastings rebounded a missed 3-pointer by junior guard Canon Beisley and, in the same quick motion, popped the ball back up and in the basket with 4.1 seconds to go. Scappoose had one last chance. After a timeout, the Indians inbounded to speedy senior guard Connor McNabb. He flew up the left side of the court and got close to the basket for a running shot at the buzzer, but the attempt hit the side of the rim and came off. Final score: St. Helens 39, Scappoose 38, in a rough-and-tumble rivalry game between two schools that are seven miles apart in Columbia County. "Oh, man, it was crazy," Hastings said of the last two possessions. "Our coach wrote up a play, and it didn't go exactly how we wanted, but Canon had a good look, and then I had a perfect lane to get the rebound, and I grabbed it, and it was like a destiny moment." It was right place, right time, for sure. "I saw him shoot it, and I knew I had to crash the boards. The ball took a perfect bounce," Hastings said. "I jumped, and it pretty much landed straight in my hands, and I just shot it up in the air." Still, McNabb's all-or-nothing full-speed drive "scared the crap out of me," Hastings admitted. "I watched him release, and I watched the ball, and I was like, 'Please don't go in,' and then it hit the corner of the rim." Indians coach Matt Humphreys drew up a play with options depending on how the Lions chose to set up their defense. "Connor did a great job getting open, getting the ball up the court quickly and getting a great look for the win. Tough luck on the miss," Humphreys said. St. Helens coach Zach Waldher said the Lions wanted to force McNabb to go to his left and take a shot from that angle. Hastings said the rivalry was on his mind all day as the hours ticked off before the game. St. Helens forward Gavin Knoke said the game had been on his mind even longer. "I've been thinking about it all year," he said. Knoke scored only three points, well under his season average, "but that's not what matters to me. It's all about the win." Scappoose's only leads were 1-0 and 38-37 — the latter after junior guard Jake Boyle hit a 3 from the right corner with 52 seconds left. St. Helens led 10-3 after one quarter, 22-12 at the half and 28-18 through three quarters. Scappoose caught the Lions at 29-29 on McNabb's 3 with 4:48 left, and the teams also were tied at 31, 33 and 35. "We knew from the start it was going to be a battle," Hastings said. St. Helens senior forward Hunter Wetherbee led all scorers with 14 points. He also had nine rebounds. Chris Beatty, a senior forward, added eight points for the Lions, who helped their cause by making five of six free throws in the final five minutes and eight of 10 for the game (Scappoose was 10 of 20 at the foul line). 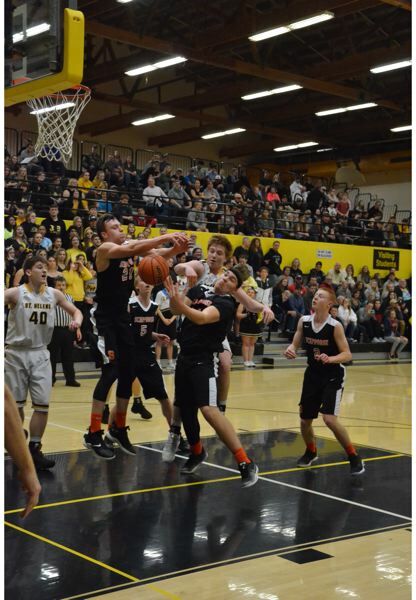 For Scappoose, junior guard Kyle Negelspach, recently called up from the JV, hit four 3's for a team-high 12 points. "We bounced back after a rough first half, but we're disappointed," Negelspach said. "We really wanted that one." McNabb and junior post Tommy McKedy each had eight points for the Indians. Humphreys liked a lot about the way his team performed. "Our boys played hard. Their effort is there," Humphreys said. The first half was a little frustrating because "we struggled to make shots," he added. "We had looks that our shooters have been working on, but they were not going down." Overall, though, "we defended them well enough to win," Humphreys said. "Giving up 39 points is nothing to feel bad about. "We just need to be able to make some more shots and score more points." The Indians' comeback "was fueled by a sustained effort in the second half and some more shots going down," Humphreys said. "Kyle hitting four 3's for us was really big. We needed those. But there were some good efforts by several players in the second half." In the end, St. Helens and its fans were able to celebrate on a big night for basketball in the area. "It was crazy in here. Bananas. So loud I couldn't hear myself sometimes," Waldher said. "This win is gigantic for our confidence."